New office spaces, new improvements, and new career opportunities! 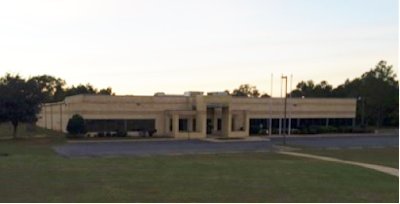 TCI Powder Coatings excitedly anticipates the opening of our new office located in Americus, GA this month. The addition will be located just a short distance away from Ellaville yet create some big change. Our Ellaville office will remain fully operational. The new Americus facility will kick-start expected growth of our laboratory and training facilities, sample product preparation, light warehousing, as well as innovative solutions and increased customer service. “This addition allows us to accommodate the steady growth of our business,” and “In the near future, we will be able to add laboratory and training facilities as well as sample product preparation and light warehousing in the new facility,” stated Doug Greene, the President of TCI Powder Coatings. Not only will this facility foster company growth, but it will also contribute to increased employment within the Americus community. It is estimated that the office will be able to accommodate up to 75 full-time employees. We are excited to expand our positive influence in the community as well as our company. We look forward to taking advantage of the new space to further contribute to the needs of our customers. To read more about the expansion and the many opportunities that will go along with TCI’s advancements, visit TCI's website. For additional information on TCI Powder Coatings, visit our website at tcipowder.com. Feel free to contact us today to have someone with our experienced team answer your powder coating questions or to see how we can help you with your powder coating needs. Dwell time to cure powder coatings varies depending on the thickness of the metal being coated. The mass of a thick substrate will require a prolonged bring-up time to heat the part to the desired metal temperature for curing the powder. Have powder coating questions? Please contact us today to speak with one of our professional service technicians. We can help you with any of your powder coating needs. When asked how long it takes for powder paint to reach its full cure state, refer to the rate of cure information provided by the powder coat supplier. 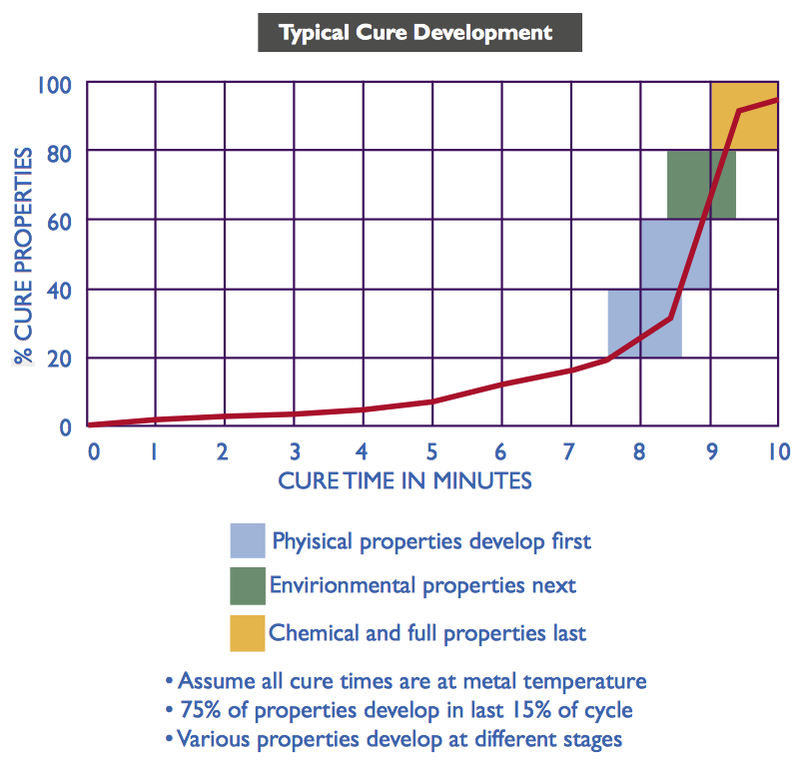 The average curing time ranges from 10 to 20 minutes after the painted part reaches the recommended temperature. 75% of powder coating properties develop in the last 15% of the cycle, and various properties develop at different stages; see below chart. As a powder coating is subjected to heat, its cure proceeds along various stages. Powder particles begin changing from a solid to semi-liquid state. Powder is fully liquefied, reaching lowest viscosity, allowing the film to smooth out. Sufficient, sustained heat triggers large scale reaction within film; this reaction is the initial step to total chemical and physical change of product. At the point when sufficient crosslinking has occurred, solidification of the film takes place. The final and most critical stage: baking. Baking causes a reaction of majority of crosslinking sites and development of optimal film properties. The film will start to lose some flexibility turning yellow in color with potentially decreased gloss below expected levels. Inter-coat adhesion is compromised and catastrophic failures become likely. For more information on curing powder coatings, read TCI's Troubleshooting Guide, or contact us today to speak with one of our professional service technicians. We can help you with application questions or any of your powder coating needs. We continuously strive to provide our customers with information to improve your powder coating process. The powder coating cure process requires a certain temperature for a certain length of time in order to reach full cure and establish the full film properties. application recommendations for specific powder coating products, check out our technical data sheets (TDS) here. 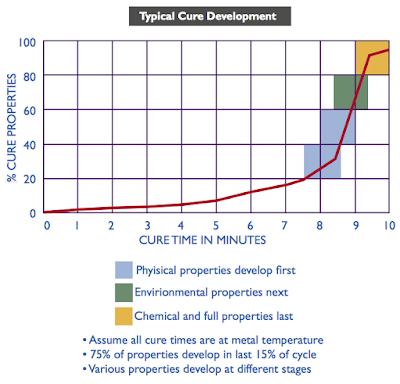 The curing schedules of various products could differ according to the below factors. · Powder Chemistry: The desired properties of cured powder arise from a chemical cross-linking reaction. · Type of Oven: Various types of ovens, such as convection, induction, and infrared heat the powder at numerous temperatures over differing amounts of time. 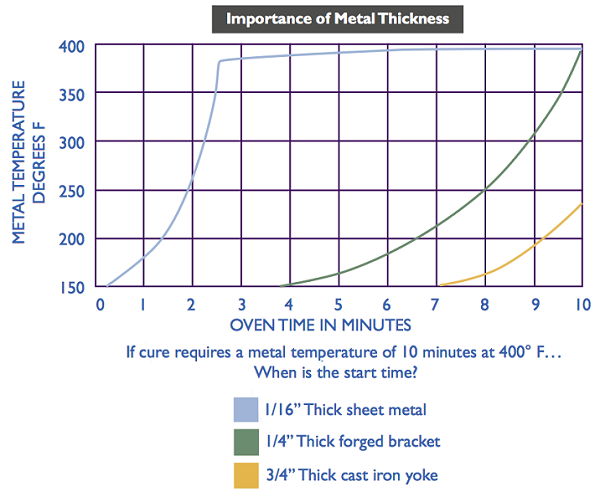 · Metal Thickness: A metal’s thickness will play a role in the oven dwell time. For a thicker metal, it will likely take more time to bring the material up to its curing temperature. · Temperature: The cure temperature will be dependent on the powder coating system used, and will effect the final product’s durability. To learn more about getting the right oven temperature, click here. · Bake Time: Depending on the material and the oven or system used, optimal bake times will vary. · Oven Efficiency: After curing, the finished product depends greatly on the quality of the oven and the type of oven used. · Air Velocity: Blowing high velocity air at the material can lead to early wear and cause impact fusion (bonded powder grains that are detached from the material, yet already cured and cannot be melted again). It is important to examine and find the best process factors in order to improve the bottom line, reduce overall costs, and meet performance requirements with quality and efficiency. Thermoset powder coatings require adequate time at the specified bake temperature to develop full design properties, while thermoplastic powder coatings are to be cured at temperatures where they can be repeatedly melted, even after they are once cooled. Should I preheat before I powder coat? It is also important to see if it is best to heat the substrate before powder coating. Although the cure process is generally performed after coating is applied, there are instances when it is preferable to heat the substrate in advance. With cast iron/aluminum products, preheating the substrate allows trapped gases to escape from the porous metal surfaces and reduces the tendency for blisters or pinholes to form in the film. There are two broad chemical categories for powder coatings: thermosets and thermoplastics. Though they sound similar, they have very different properties and applications. The primary physical difference is that thermoplastics can be re-melted back into a liquid, whereas thermosets always remain in a permanent solid state. Thermoset Curing Process: Thermosets contain polymers that cross-link together during the curing process to form an irreversible chemical bond. The cross-linking process eliminates the risk of the product re-melting when heat is applied, making thermosets ideal for high-heat applications such as electronics and appliances. Thermoplastic Curing Process: Thermoplastic pellets soften when heated and become more fluid as additional heat is applied. Since no chemical bonding takes place, the curing process is completely reversible. This characteristic allows thermoplastics to be remolded and recycled without negatively affecting the material’s physical properties. Each material has its appropriate time and place for use. Thermosets are well established in the market, frequently have lower raw material costs, and often provide easy forming to final part geometries therefore being easier to process. Thermoplastics tend to be tougher, can have better chemical resistance, and are more easily recycled and repaired. 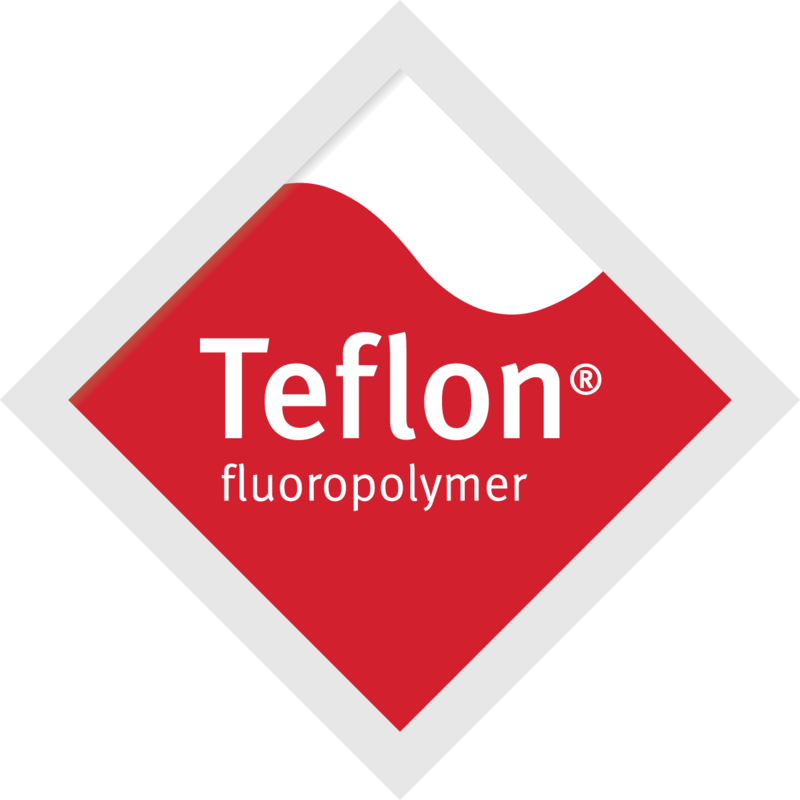 Teflon™ powders are free-flowing powders that can be applied with conventional electrostatic powder equipment using either spray guns or a fluidized bed. 532-1003 Black Powder Coating is a unique blend of fluoropolymers and resins. This powder coating has superior toughness along with excellent corrosion resistance and good nonstick properties. 532-1003 is a low cure coating with no VOC emissions, a distinct advantage of using powder coating. 532-1003 is a general industrial powder coating with many possible end uses including but not limited to: interior and exterior piping, chemical drip pans, and air movement blades. Now is the time to give Teflon™ coatings a try without investing in additional equipment. All you need is your spray gun and oven!